At least 8 people were killed and more than 30 others injured on October 11, 2017 in renewed protests across Ethiopia’s restive Oromia state. Peaceful protests were reported again on Thursday in several Oromia towns, including Woliso in West Shawa, where locals reported a peaceful rally of more than 15,000 people. Yesterday’s deadly protests appear to have been organized unlike previous ones, which were usually, although not always, preceded by media announcements from abroad. In fact, some diaspora-based activists denounced yesterday’s demonstrations as the work of spoilers and agents of the ruling Tigrayan People’s Liberation Front (TPLF). Officials from the Oromia regional state also said the protests were planned by forces that want to weaken Oromo unity. The protests went ahead despite calls for their cancellation. Demonstrators took to the streets in large numbers in more than dozen towns in West Arsi, West Shawa, Wallaga, and Hararge zones. 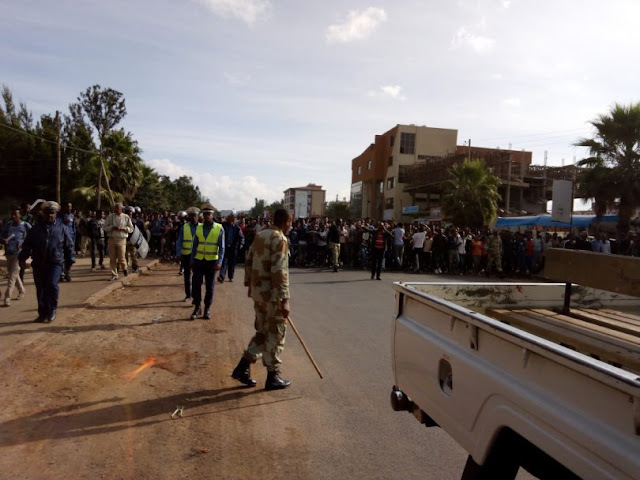 The protests in the latter have been ongoing and largely in response to continued incursions by the Liyu Police of the adjoining Somali Regional State of Ethiopia. For days, several Oromo activists warned protesters not to join the protests called by unknown individuals under the banner of “waamicha harmee” – meaning Oromia’s call – out of concern that protests lacking clear political goals were fruitless. Although the organizers were unknown, the slogans were nothing unusual: Down down Wayane, release opposition leaders from prison, and no to fake federalism. What does this mean? Does it mean diaspora activists are being left in the cold by home-based groups who have their own agenda other than waiting on a hollow promise of change to be midwifed by Oromo Peoples’ Democratic Organization (OPDO) at some future date? Does it mean the OPDO has lost control of the streets? Does it indicate the lack of coordination and clear chain of command within the grassroots movement? Was this the inevitable instance of social media being weaponized by state actors? Were there targeted and geotagged campaigns within Ethiopia by TPLF agents and social media consultants? Prior to yesterday’s protests, senior OPDO leaders held massive town hall meetings in flashpoint towns, including Ambo, and it appeared they were connecting with the public. But the widespread protests upended it all. In three-years of protests, the prelude to Irreechaa 2017 was the only time protest leaders across the Atlantic were seen to be on different pages. The peaceful conclusion of this year’s thanksgiving festival signaled that the fences were all mended. Then came the Malka Atete celebrations in Sabata and Burayu towns in central Oromia. The latter events differed from Irreecha by the unusually large display of Oromo resistance flags. The sheer size of flags at the event came as a surprise because leaders of the Oromo Gadaa council had called on all attendees not to bring any flags and partisan emblems. This led to spirited debates among Oromo activists for several days. Others speculated that the unusually large display of the flags must be the work of some organized group, perhaps even the regime with the aim of using it as a pretext for violent crackdown and justification for another Oromia-wide state of emergency. The development was significant enough that even pro-TPLF bloggers weighed in. For example, Horn Affairs editor Daniel Berhane noted that when people hoist that flag and mention the name Oromo Liberation Front (OLF), they are not referring to the OLF faction in Asmara but the nation’s spirit of resistance against oppression. This focus on the flag and OLF prompted the Asmara-based group to aggressively pushback on social media, even appearing to suggest it was behind the protests. From what we know, OLF and its affiliated Qeerroo Bilisummaa did not publicly call Wednesday’s protests and its reach doesn’t extend as widely as the protests were. They simply lack the kind of grassroots organizational capacity necessary to pull off demonstrations of this size. Besides, the group calls its protests Fincila Xumura Gabrummaa (FXG), the final push to end Oromo subjugation, and no calls for protests under this slogan went out. Most importantly, it would have formally claimed responsibility for the massive turnout if it was behind it. Besides, some of the slogans, for example about making the federation meaningful, are contrary to the demands of the Asmara group. Regardless, #OromoProtests is entering a new critical phase. Many hope that this week’s deadly protests were but a one-off instance of breakdown in communications and leaders of the grassroots movement will move swiftly to assert control. A repeat of a similarly uncoordinated protests would be seen as a sign of rupture within the protest movement. If past trends are any indication, the grassroots movement has been so resilient that it overcame its shortcomings after each hiccup. Revolutions are slow-cooking. However, prolonged revolutions tend to self-destruct and atrophy. The culprit is usually the appearance on the stage of dark forces that may not necessarily be in line with the overall objective of the movement other than disrupting the status quo. Without the decisive battles that mark watershed moments and make whatever gains are made irreversible, revolutions are still in uncertain waters. So far the gains made as a result of the huge sacrifices incurred over the past three years are largely symbolic and rhetorical…with the possible exception of the change of attitude by Oromia police as well as the Oromia regional administration. It had once appeared as if the latter is in charge. Yesterday’s mass protests requires a rethink of all calculations by the OPDO and diaspora activists and all responsible forces. That said, OPDO leaders should not and could not rest on their laurels. The youth protesters have great sympathy for their plight and dreams of autonomy from the domineering Center. Arresting suspects in the killing of protesters yesterday is a remarkable departure from the past and could only increase sympathy towards the regional government. However, sympathy is far from loyalty. Besides, the organization is only recently baptized as part of the Oromo struggle for freedom rather than a Trojan horse for the TPLF, which was the prevailing view among the Oromo public until 2014, when nation-wide protests broke out, and more incontestably after October 2016 when Lemma Megersa and his nationalist wing of young Turks took the helm at the organization. Protesters will garner confidence only after seeing concrete change at the federal level. The changes in Oromia state level are encouraging. The state-run media outfit is putting out critical reports and airs documentaries critical of the federal authorities that have refused to heed the demands of the Oromo people and instead ordered not only killing of peaceful protesters but also displacements of thousands from their ancestral homes using a proxy army, the Somali regions Liyu Police. But that is far from enough. Labeling it as the work of the enemy harkens back to the dark days of the past when Oromo against Oromo rivalries undermined a united struggle against oppression and marginalization. Rather than the work of an enemy or internal saboteurs, the protests could also signal a renewed push towards taking the struggle into a new stage aimed at changing the TPLF regime.